Objectives To evaluate (i) the association between random certolizumab drug levels, antidrug antibodies (ADAbs) and treatment response in patients with rheumatoid arthritis (RA); (ii) longitudinal factors associated with ADAbs and certolizumab drug levels. Methods This prospective cohort included 115 patients with RA treated with certolizumab. Serum samples were collected at 3, 6 and 12 months following treatment initiation. Drug levels and ADAbs were measured using ELISA and radioimmunoassay, respectively, at 3, 6 and 12 months. Disease Activity Score in 28 joints (DAS28) were measured at each visit and 12 months European League Against Rheumatism (EULAR) response was calculated. Patient self-reported adherence was collected longitudinally. Ordinal logistic regression and generalised estimating equation were used to test the association: (i) between drug levels, from serum sampled and treatment response; (ii) between ADAbs and drug levels; (iii) patient-centred factors and drug levels. Results ADAbs were detected in 37% (42/112 patients by 12 months). 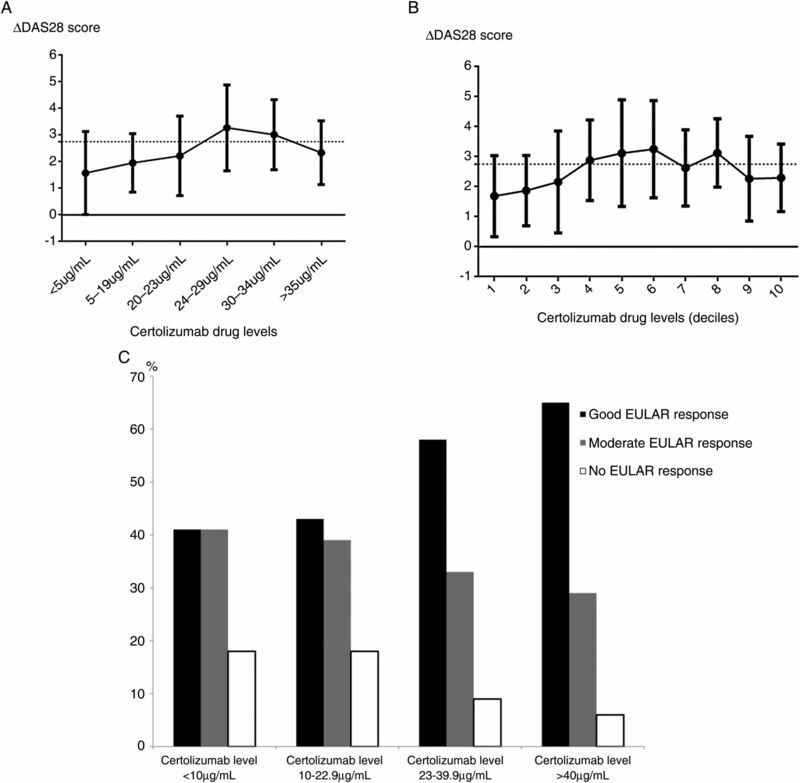 The presence of ADAbs were significantly associated with lower drug levels over 12 months (β=−0.037, 95% CI −0.055 to 0.018, p<0.0001) but not independently with 12 months EULAR response (β=0.0013 (95% CI −0.0032 to 0.00061), p=0.18). Drug level was associated with 12 months EULAR response (β=0.032 (95% CI 0.0011 to 0.063), p=0.042). In the multivariate model, ADAb level and adherence were significantly associated with drug concentrations. Conclusions This is the first study to demonstrate that higher certolizumab drug levels are associated with better 12 months EULAR response. ADAbs in certolizumab-treated patients with RA were detected at higher levels than previous studies and help determine the aetiology of a low drug level. Initial registration trials in certolizumab-treated patients with RA revealed low ADAb levels using an ELISA, ranging 5.1%–6.1%.1 ,2 In a post hoc Crohn's disease trial analysis, higher certolizumab drug levels were associated with endoscopic response and remission.8 To date, there have been no prospective observational studies assessing drug levels and ADAbs for correlation with treatment response in certolizumab-treated patients with RA. The aims of this study were to (i) assess the incidence of ADAbs in certolizumab-initiated patients with RA using sensitive detection techniques; (ii) test the association between certolizumab drug levels, ADAbs and 12 months treatment response in patients with RA; (iii) assess baseline and longitudinal factors associated with certolizumab drug levels and ADAb formation. Certolizumab-initiated patients were recruited to a prospective observational cohort study, the Biologics in Rheumatoid Arthritis Genetics and Genomics Study Syndicate (BRAGGSS), from 60 UK centres between March 2010 and January 2015.9 From the total cohort, 115 patients were selected, according to the following inclusion criteria: RA according to the revised American College of Rheumatology 1987 criteria,10 active disease indicated by a 28-joint Disease Activity Score (DAS28) of ≥5.1 despite earlier treatment with at least two non-biologic disease-modifying antirheumatic drugs (nbDMARDs) including methotrexate; patients of Caucasian descent; about to be initiated on subcutaneous certolizumab 400 mg every 4 weeks; baseline visit recorded with ≥1 subsequent visit where serum samples and clinical data were available. Following initiation of therapy, patients had serum samples collected and disease activity assessed at 3, 6 and 12 months.9 Clinical and patient questionnaires, including patient self-reported adherence, were collected at each time point. Adherence was classified as previously defined.11 Contributing patients provided written informed consent, and the study was ethically approved (COREC 04/Q1403/37). The measurement of random certolizumab concentrations was performed using a sandwich ELISA and ADAbs using radioimmunoassay (RIA) designed by Sanquin, Amsterdam, The Netherlands, as previously described for infliximab/adalimumab patients.14 RIA measures the amount of IgG antibodies specific for certolizumab. Patients were defined as being positive if ADAb titres were >20 AU/mL, as specified by cut-off values generated by Sanquin. Between-group comparisons were investigated using independent sample t tests, Mann–Whitney U (Wilcoxon) statistics or χ2 tests, as appropriate. Ordinal logistic regression was used to test the association between EULAR response at 12 months and drug levels. To assess effect of covariates longitudinally on certolizumab drug and ADAb levels at 3, 6 and 12 months, generalised estimating equation (GEE) with an identity link was used. The multivariate model included significant factors from univariate analysis. The last observation was carried forward for patients with incomplete data. Statistical analyses were performed using STATA for Windows V.13.0 and Graph Pad Prism 6.04 for concentration–effect curve generation. Over 12 months, 253 serial samples (n=115 patients) were tested for certolizumab drug levels (112 had sufficient sample for ADAb measurement). ADAbs were detected in 37% (42/112 patients) by 12 months of treatment. The baseline characteristics of the total patient population and stratified by detectable ADAbs is shown in table 1. Patients who had detected ADAbs had significantly higher swollen joint counts at baseline. Six patients (14.3%) who developed ADAbs, received a prior biologic versus three patients (4.3%) in the group who did not develop ADAbs. Baseline use and dose of nbDMARDs and oral steroids did not differ significantly between groups (table 1). Of the 20 patients who did not complete 12-month follow-up, 11 (55%) stopped due to inefficacy, 6 (30%) stopped due to adverse events (AEs), 1 (5%) each stopped due to inefficacy/AEs, poor adherence (5%) and imminent heart surgery (5%). Of the patients who experienced AEs, two (one with recurrent chest infections) had drug levels of >40 μg/mL, two had drug levels 28–32 μg/mL (exacerbation of chronic obstructive pulmonary disease symptoms; bilateral pitting oedema and excessive fatigue, respectively), while one patient stopped due to feeling generally unwell with drug levels of 0.2 μg/mL (none with ADAbs). The patient who stopped due to both inefficacy and AEs had drug levels of 2.6 μg/mL and ADAbs of 70 AU/mL at 6 months. Additional information about all patients who developed AEs and their pharmacological tests is provided in online supplementary table S1. The ADAb titre ranged from 22 to 1600 AU/mL. The presence of ADAbs were significantly associated with lower drug levels over 12 months using GEE (β=−0.037, 95% CI −0.055 to −0.018, p<0.0001), but not independently with 12 months EULAR response (β=0.0013 (95% CI −0.0032, to 0.00061), p=0.18). Using ordinal regression, drug level was associated with 12 months EULAR response (β=0.032 (95% CI 0.0011 to 0.063), p=0.042). Figure 1A,B shows concentration–effect curves for certolizumab-treated patients. There was a trend for higher certolizumab levels (>23–24 μg/mL) to be associated with improvement in DAS28 from baseline. Patients with the highest certolizumab drug levels had a higher proportion of EULAR good responders at 12 months (figure 1C). (A) Certolizumab concentration–effect curve at 6 months (using drug-level thresholds). (B) Certolizumab concentration–effect curve at 6 months (deciles). (C) Certolizumab levels in European League Against Rheumatism (EULAR) good, moderate and non-responders at 12 months. In figures 1A/B each point represents the mean ΔDAS28 (point) and SD (error bars) for the certolizumab drug level range measured at 6 months of treatment stratified in ascending order. Due to the distribution in drug levels, stratification of drug concentrations was performed as described in figure 1A. Figure 1B represents mean ΔDAS28 and SD for deciles generated from the certolizumab drug level data at 6 months, similar to previous studies13: (1) 0–10 μg/mL, (2) 11–20 μg/mL, (3) 21–23 μg/mL, (4) 23–24 μg/mL, (5) 25–29 μg/mL, (6) 29–31 μg/mL, (7) 31–33 μg/mL, (8) 31–38 μg/mL, (9) 39–46 μg/mL and (10) >46 μg/mL. Figure 1C represents the percentages of EULAR responders when stratified by serum certolizumab level. The data represents all 115 patients using last observation carried forward. Patient numbers in each category are as follows: certolizumab levels <10 μg/mL: good EULAR response, 7; moderate EULAR response, 7; no EULAR response, 3; certolizumab levels 10–22.9 μg/mL: good EULAR response, 10; moderate EULAR response, 9; no EULAR response, 4; certolizumab levels 23–39.9 μg/mL: good EULAR response, 34; moderate EULAR response, 19; no EULAR response, 5; certolizumab levels >40 μg/mL: good EULAR response, 11; moderate EULAR response, 5; no EULAR response, 1. Factors associated with certolizumab drug level in the univariate GEE analysis were gender, adherence, body mass index, CRP and ADAb level (table 2). In the multivariate model after adjustment of confounders, ADAb levels and adherence remained significant (table 2). Certolizumab drug concentrations showed a strong inverse association with certolizumab ADAb level longitudinally over 12 months (table 2). This study demonstrates for the first time that certolizumab ADAbs were detectable in 37% of patients with RA over 12 months of treatment. Detectable ADAbs were associated with lower certolizumab drug concentrations, but not independently with treatment response. However, higher certolizumab drug levels were associated with better 12 months EULAR response. Following adjustment, ADAb concentrations and biologic adherence remained the most important predictors of drug levels over time. Our data demonstrates that even small, non-glycosylated fragments such as certolizumab can be immunogenic. The higher levels of ADAbs detected compared with previous certolizumab trials1 ,2 is noteworthy. However, in contrast to other biologics, ADAbs against certolizumab may be detected more easily even in the presence of drug. Certolizumab is a Fab fragment, monovalent, and therefore, drug–ADAb complexes easily dissociate and can thus be detected despite the drug not necessarily being more immunogenic. RIA, for the detection of ADAbs, has not been used in published certolizumab trials to date. Our data suggests potential for clinical application, but further studies are needed to validate optimal use of the assay in clinical practice. While not being independently associated with treatment response, ADAbs showed a strong inverse correlation with circulating certolizumab drug levels. Therefore, detection of ADAbs need not significantly influence treatment response if sufficient drug is still in circulation but may provide valuable insight into the aetiology of low drug levels in certolizumab-treated patients. Certolizumab drug concentrations reflect the amount of circulating drug available to bind to the target, so measurement of drug concentrations9 may help in determining the aetiology of non-response. This is the first study that has found an association between detectable ADAbs to certolizumab and drug concentrations. Other studies have demonstrated in TNFi treated patients, a high disease burden at baseline may be associated with ADAb formation.15 In the current study, pretreatment swollen joint count was significantly higher in patients with detectable ADAbs, supporting data that baseline inflammation may associate with drug concentrations and certolizumab ADAbs. A strength of our study is the capture of additional factors likely to influence treatment response and drug concentrations in a real-life setting. Of these, adherence was an important factor influencing certolizumab levels (although CIs were wide, as non-adherence was infrequently reported). A low certolizumab drug level in the absence of ADAb formation may prompt a discussion with the patient regarding reasons for non-adherence, also shown to be important in adalimumab-treated patients.9 While several TNFi therapeutic drug-monitoring studies have used trough-level serum samples to measure both ADAbs and drug levels to reduce drug interference, ascertainment of random levels is clinically practical. We have previously demonstrated that low random TNFi drug levels in adalimumab-treated patients have been associated with poor treatment response in RA over 12 months.9 However, a limitation of our study is that, while 37% of patients had detectable ADAbs to certolizumab, this may under-represent the true value due to drug interference. Whilst our study did not identify a clear drug concentration cut-off for treatment response in patients with non-trough samples, higher 6 months certolizumab levels (>23–24 μg/mL) were associated with higher ΔDAS28. However, four patients who had an adequate response at 6 and 12 months had undetectable concentration levels, two of whom had ADAbs detected. These patients may represent a unique subset, in which certolizumab could be stopped, avoiding the need for future treatment with expensive biologics. In summary, certolizumab drug levels may be useful in therapeutic drug monitoring in combination with clinical parameter assessment. Measurement of ADAbs may facilitate the interpretation of low drug levels and provide valuable information about future strategy. More information is required, however, on the cost-effectiveness of using these tests before implementation in clinical practice. We acknowledge the support from Sanquin Laboratories in The Netherlands for the analysis of antidrug antibodies for our samples using radioimmunoassay. We thank the Medical Research Council (grant number G1000417/94909), Arthritis Research UK for their support (grant reference 20385 and 20830) and the NIHR Manchester Musculoskeletal Biomedical Research Unit. This report includes independent research supported by the National Institute for Health Research Biomedical Research Unit Funding Scheme. The views expressed in this publication are those of the author(s) and not necessarily those of the NHS, the National Institute for Health Research or the Department of Health. HC and AB joint last authors. Collaborators BRAGGSS Collaborators: Prouse PJ, Moitra RK, Shawe DJ, Nisar M, Fairburn K, Nixon J, Barnes T, Hui M, Coady D, Wright D, Morley C, Raftery G, Bracewell C, Bridges M, Armstrong D, Chuck AJ, Hailwood S, Kumar N, Ashok D, Reece R, O’Reilly SC, Ding T, Badcock LJ, Deighton CM, Raj N, Regan MR, Summers GD, Williams RA, Lambert JR, Stevens R, Wilkinson C, Kelly CA, Hamilton J, Heycock CR, Saravanan V, Cope A, Garrood T, Ng N, Kirkham B, Green M, Gough A, Lawson C, Das D, Borbas E, Wazir T, Emery P, Bingham S, Morgan A, Bird HA, Conaghan PG, Pease CT, Wakefield RJ, Buch M, Bruce I, Barton A, Gorodkin R, Ho P, Hyrich KL, Parker B, Smith W, Jenkins E, Mukhtyar C, Gaffney K, Macgregor AJ, Marshall T, Merry P, DeSilva C, Birrell FN, Crook PR, Szebenyi B, Bates D, James D, Gillott T, Alvi A, Grey C, Browning J, McHale JF, Gaywood IC, Jones AC, Lanyon P, Pande I, Doherty M, Gupta A, Courtney PA, Srikanth A, Abhishek A, Das L, Pattrick M, Snowden HN, Bowden AP, Smith EE, Klimiuk P, Speden DJ, Naz S, Ledingham JM, Hull RG, McCrae F, Cooper A, Young-Min SA, Wong E, Shaban R, Woolf AD, Davis M, Hutchinson D, Endean A, Mewar D, Tunn EJ, Nelson K, Kennedy TD, Dubois C, Pauling J, Korendowych E, Jenkinson T, Sengupta R, Bhalla A, McHugh N, Chinoy H, O'Neill T, Herrick AL, Jones AK, Cooper RG, Dixon WG, Harrison B, Buckley CD, Carruthers DC, Elamanchi R, Gordon PC, Grindulis KA, Khattak F, Raza K, Situnayake K, Akil M, Till S, Dunkley L, Tattersall R, Kilding R, Tait T, Maxwell J, Till S, Kuet K-P, Plant MJ, Clarke F, Fordham JN, Tuck S, Pathare SK, Paul A, Marguerie CP, Rigby SP, Dunn N, Abbas I, Filer C, Abernethy VE, Clewes AR, Dawson JK, Kitas G, Erb N, Klocke R, Whallett AJ, Douglas K, Pace A, Sandhu R, John H, Shand L, Lane S, Isaacs JD, Foster H, Griffiths B, Griffiths I, Kay L, Ng W-F, Platt PN, Walker DJ, Peterson P, Lorenzi A, Friswell M, Thompson B, Lee M, Pratt A, Hopkinson ND, Dunne CA, Quilty B, Marks J, Mukherjee S, Mulherin D, Chalam SV, Price T, Sheeran T, Venkatachalam S, Baskar S, Al-Allaf W, McKenna F, Shah P, Filer A, Bowman SJ, Jobanputra P, Rankin EC, Allen M, Chaudhuri K, Dubey S, Price-Forbes A, Ravindran J, Samanta A, Sheldon P, Hassan W, Francis J, Kinder A, Neame R, Moorthy A, Bukhari M, Ottewell L, Palkonyai E, Hider S, Hassell A, Menon A, Dowson C, Kamath S, Packham J, Dutta S, Price S, Roddy E, Paskins Z, O'Reilly DT, Rajagopal V, Bhagat S, Chattopadhyay CB, Green M, Quinn D, Isdale A, Brown A, Saleem B, Foo B, Al Saffar Z, Koduri G.
Contributors MJ, HC and AB were involved in the study conception, design and interpretation of results. The rest of the authors were involved in acquisition of data, final interpretation and review of manuscript. Funding for the study was provided by the first author’s MRC fellowship. AB is the principal investigator of BRAGGSS. Funding MJ is supported by an NIHR clinical lectureship and was an MRC Clinical Training Fellow supported by the North West England Medical Research Council Fellowship Scheme in Clinical Pharmacology and Therapeutics, which is funded by the Medical Research Council (grant number G1000417/94909), ICON, GlaxoSmithKline, AstraZeneca and the Medical Evaluation Unit. Competing interests MJ reports honoraria from UCB, Abbvie and Pfizer, outside the submitted work. JDI: advisory boards Pfizer, Roche, Abbvie, Janssen, Grants Roche, Pfizer, UCB. AWM has provided consultancy to GSK outside the submitted work. KLH reports honoraria from Abbvie and Pfizer outside of submitted work. HC has received honoraria, lecture fees and/or research grants from Abbvie, Janssen, MSD, Pfizer, UCB, Roche, Celgene and Servier, outside the submitted work. AB reports honoraria and/or grants from Pfizer, Abbvie, Eli-Lilly and Sanofi-Aventis outside the submitted work. Ethics approval UK Multicentre Research Ethics Committee (COREC 04/Q1403/37).